humpdf -- Embed Humdrum files into a PDF file. -A Output only the altered portion of the PDF file. -c Report the number of Humdrum files embedded in the PDF file. See -n and --list options. (not yet implemented). -C Report the number of all files embedded in the PDF file. See -N and --list-all options. (not yet implemented). -D Store directory information of input Humdrum files from the command line. -n # Extract the nth Humdrum file embedded in the PDF file (offset from 1). (not yet implemented). 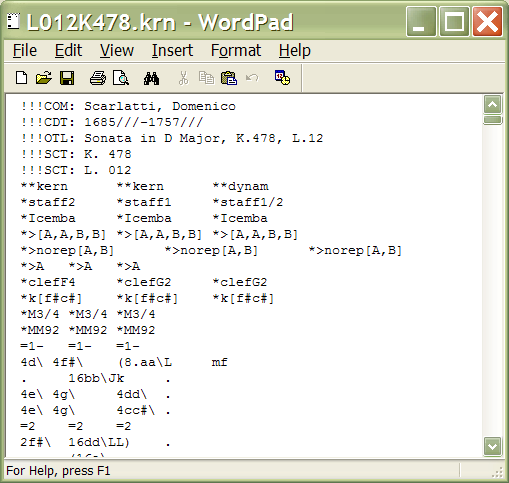 -N # Extract the nth file embedded in the PDF file (offset from 1). (not yet implemented). -p pdf Use the following PDF file as input. -P prefix Use the following prefix before embedded filenames. The humpdf program is used to embed Humdrum files into PDF files, which are typically created from the Humdrum file, or represent a scan of the music used to encode the Humdrum file. The embedded Humdrum file can be accessed by any Humdrum Extras program as if it were a regular Humdrum file. When a PDF file is read by a Humdrum Extras program instead of an expected Humdrum file, it will automatically be identified as a PDF file and searched for embedded Humdrum data files. 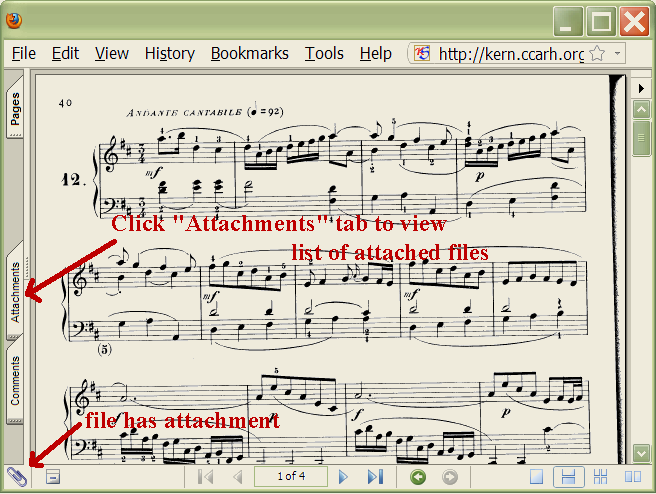 All PDF files downloaded from the kernScores website contain an embedded Humdrum file (if the PDF file has a companion Humdrum file), such as this one used as an example in a later section below. The -p option specifies the original PDF file to which the Humdrum file will be embedded. Results of the humpdf are sent to standard output, so redirect the results to a file. Embedded files can be viewed as "Attachments" in Adobe Reader. Below is an example view of the Adobe Reader plugin in Firefox with this file. The paper clip icon at the bottom left indicates that the PDF file contains an attachment. You can view a list of the attached files by clicking on the "Attachments" tab on the left side of the viewer. In versions of Adobe Reader which do not display an "Attachments" tab, the attached files can be viewed by clicking on the paper clip icon instead. After displaying the attachments, you should see a file listing underneath the main PDF page viewing window. In this case there is one file called L012K478.krn. 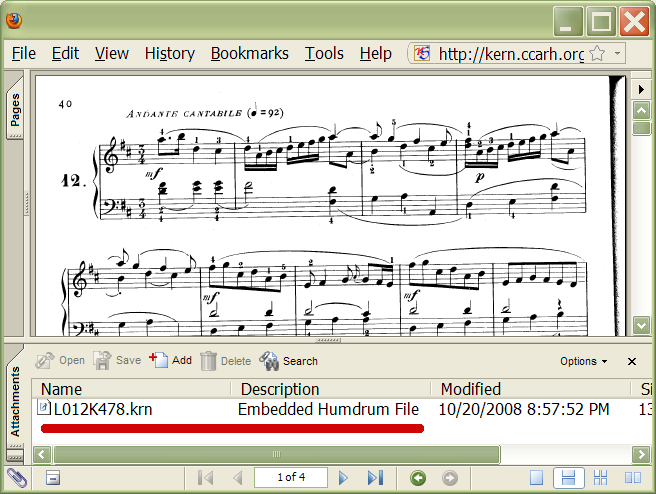 Also notice that the Description of the file is "Embedded Humdrum File". This description string is required in order for the Humdrum Extras programs to recognize the embedded file as a Humdrum file. You may also embed files using Adobe Reader by clicking on the "Add" icon above the attachment Name field. If you want Humdrum Extras programs to treat the attached file as a Humdrum file, then you must add the description string "Embedded Humdrum File". That string can be followed by or preceded by any other text in the description string. Notice that the input PDF file does not contain an embedded file, while the output file does. Above this basic file organization comes a header. The first line of the file must start with the string "%PDF-" followed by the PDF standard to which the file conforms. In the following example, PDF specification 1.4 is being used. The second line of the file should contain a comment line which has at least 4 bytes of data containing high-order ASCII data (bytes with values greater than 127). This is a hack used to force certain pieces of software or operating systems to process the file as binary data rather than text data (newlines of the different Windows/Apple/Unix formats can exist in the file, and reading the file as text data may incorrectly translate these formats to the native format of the local computer). At the bottom of a PDF file, the last line is required to be "%%EOF". On the penultimate line, the byte offset of the most recent cross reference table is found; and on the line before that the string "starxref" is required. In this case the value 192 means to go to the 193rd byte in the file (or 192nd byte when counting the bytes starting at 0). At that point you will find a cross reference table which starts with the string "xref". Following the "xref" string are two numbers: (1) The starting indirect object number being listed below, and (2) how many indirect objects are listed in sequential order after the first one. In this example, the string "0 5" means that the first object is number 0, and there are 4 indirect objects entries after the first one in the list below. Indirect object 0 is a special object which functions like a NULL pointer in C.
Each object entry in the cross referecne table consists of a line with exactly 20 characters. The first ten characters are digits which gives the byte-offset value for the start of the indirect object. For example, object 1 starts at byte offset 16 (the 17th byte in the file). Offsets smaller than a billion are padded with zeros. Next comes exactly one space, followed by five digits which indicates the generation number (typically set to zero), then another space, then either the character 'n' (meaning "iN use") or 'f' (meaning a (Free [unused] object), followed by a two-character newline (0dh 0ah in hex notation). After a listing of object offsets is given, another set of entries can be given, starting with the first object number and a count of how many objects in the seqential list. The trailer which follows the xref section gives a few important pieces of information in the form of a dictionary (which is a set of associative pairs of keys and values surrounded by double angle brackets: <<...>>). A typical trailer is required to have an entry called /Size and /Root, and may have other optional entries. The /Size entry's value of 5 means that there are a maximum of five indirect objects in the PDF file (as might be suitable for the above example PDF with objects number 1-4, plus the 0 object). The /Root entry's value "0 1 R" is a reference to indirect object number 1 (generation 0). The Root object is the catalog dictionary of the PDF and behaves like the root of a file system. The humpdf program embeds data files using a feature of PDF files called incremental updates. With this method of chaning a PDF file, the original contents of the file can be recovered from the modified file if necessary. All new objects are appended to the previous PDF file's contents, as well as an updated version of any indirect object from the previous file contents. Looking at the trailer, the root object is number 1. Object 1 contains three entries in its dictionary: /Type, /Pages, and /Metadata. The /Catalog value of the /Type entry is required for the root object, and the /Pages entry contains a pointer to indirect object 3 for a list of the pages in the file. Going to object 3, you will see there is a list of pages, one page which is contained in object 4. Object 4 gives a basic descriptive informatnion for the page, and in particular the contents for the page which is contained in object 5. Object 5's content is compressd, so it has been removed from the above example text. The humpdf program currently cannot be used to embed files into a PDF which already has embedded files. The source code for the program was last modified on 6 May 2010. Click here to go to the full source-code download page.